This page is written by the game's inventor, Graeme Neatham. Being currently in the throws of attempting to design some quite large Hexagonal variants (e.g. 331 cells or hexes), I felt the need for a mental diversion.Â A design holiday if you will. So I took myself off to the lighter side of design, to a place I had not been before with small boards, square cells and a mere handful of pieces. The board has 28 squares and the image below shows the initial array. Image above is from a screenshot produced by Zillions of Games. Zip file containing zrf and graphics is available here. 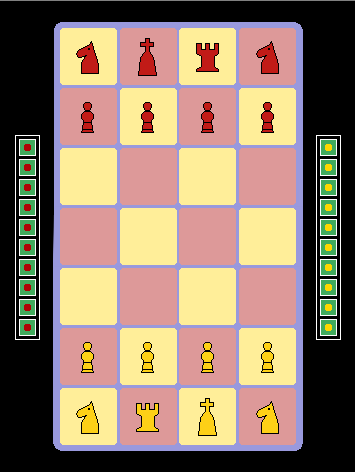 Each player starts with 8 pieces - 4 Pawns, 2 Knights, 1 Rook, and 1 King. All pieces except the Pawn move as in orthodox FIDE chess. The Pawn moves as a combination FIDE Pawn and Berolina Pawn.Â (This piece is also known as a Sergeant). The Pawn in Spartan Chess may thus move and capture one square directly or diagonally forward.Â There is, however, no initial double move for the Pawn, nor is the King able to castle. On reaching the far most rank a Pawn is promoted to Knight or Rook. The two sides are Gold and Red, Gold moving first. The aim is to checkmate the enemy King or stalemate your opponent. 3-fold repetition, bare kings, or each player making 10 consecutive moves that are not pawn moves or captures, all result in a draw. In designing this variant the main aim was to keep it simple, not to say austere.Â In short I wanted to design a Spartan game. In order to simplify it seemed natural to reduce the pieces, both in number and type.Â Kings and Pawns seem to me to be the essence of chess with the other pieces varying over time and with location;Â near constants in the history of chess being perhaps the Rook and the Knight.Â So I settled on a game with just Kings, Pawns, Knights and Rooks. Simply swap the Rook and the adjacent Knight and it's fixed! How would you change the opening arrangement to address these issues you brought up? This game suffers from 3 weak Pawns. There is also an early pin with the Rook and early checkmate with a Pawn and Rook. This isn't a terrible game, and I understand you were taking a break, but I still think it could be better.